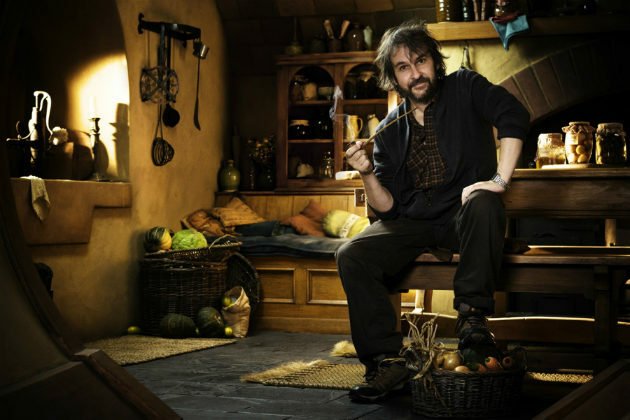 Hobbit director Peter Jackson is nothing if not a man of the people, so when he took to San Diego's Comic-Con earlier this month to present footage to 6,000+ lucky fans shortly after wrapping, he recorded a video diary to share with the rest of the Lord of the Rings faithful. Watch as Jackson navigates the perils of press junkets and Hall H's screaming fans, filming on his trusty iPhone along the way! Or, y'know... skip ahead a few minutes to fantastic 10+ minutes of behind-the-scenes peeks from the set of The Hobbit. The set footage is the real treat for fans hungry for Hobbit peeks, but you've got to also hand it to Jackson and his videography crew for interviewing just about everybody involved in production, down to the freaking key grip. And yet, my favorite part? Mark Hadlow in costume as the Dwarf Dori, quoting Anchorman. Runner-up line of the vid: "I've never worked on such a hairy movie." The Hobbit: The Unexpected Journey hits theaters December 14, with its conclusion, There and Back Again, following in 2013. I was wondering if you could tell me when The Dark Knight Rises is going to hit the mid-70's on Rotten Tomatoes, as you predicted it would last week. I just checked, and it appears that TDKR still has an 87% fresh rating on RT. I took your prediction very seriously; after all, you ARE a former Rotten Tomatoes editor (such a prestigious job! almost as prestigious as Movieline blogger!). You said that after the NY and LA critics chimed in, the rating would drop because the film isn't as great as it looked during the previews. Instead, the movie received an "A" Cinemascore and the RT score has climbed (it was at 84% when I first read your article). So what gives? You do know what you're talking about, don't you? Or is that you didn't like what you perceived to be the film's politics, and because you are so narrow-minded that you judge pop culture based on whether it conforms to your political views, you disliked the movie for that reason? Or are you just really bad at your job? Didn't you learn anything during your time at RT? Anyway, I'm sure you'll update your earlier post with an acknowledgement that you were wrong. Looking forward to reading it. As a great fan of LotR and the Hobbit, I'm so ecstatic to know that I am a blurry figure in the third row of Peter Jackson's footage of the crowd at Comic-Con. The energy was electrifying, and I was very much emotionally moved being in the presence of such individuals that inspire and motivate my very being to live creatively and aim for their standards of quality. It was truly an epic moment in my life and I will never forget the experience. One memory I will always retain is when the very first LOTR movie debuted in Toronto in 2001, I was in the audience for the screening (two days before the opening). Peter Jackson and John Rhys-Davies were both on hand to introduce the picture. We had no idea what to expect, but as the first film ended I will always remember what my wife said as the credits rolled: "That was majestic." Best three word review the film ever got. And to have Jackson and Davies intro it was the icing on the cake. Can't wait for The Hobbit to launch later this year.